A mixed box of two new golf ball models from Snell Golf. During his time at Titleist he worked on the original Pro V1, Professional, and Tour Prestige, among others. While at TaylorMade (where he was VP of R&D for golf balls) he helped design the TP Red, TP Black, Penta, Tour Preferred, and Project (a). Currently Snell holds 38 U.S. Patents in golf ball technology and design. Having worked with Tour players like Tiger Woods, Sergio Garcia, Phil Mickelson, Justin Rose, Jason Day, Dustin Johnson, and others, Snell is uniquely qualified to create Tour-centric models as well as models for average players, and with the launch of his new company, Snell Golf Inc., that's exactly what he's doing. 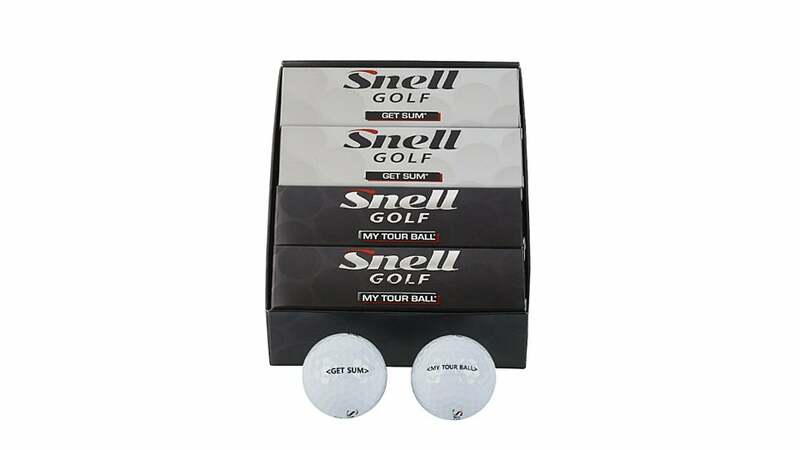 The main difference between Snell Golf balls and many of the other models available today is the lower pricing, which is sure to make a lot of players pay attention. "The game is changing and people are leaving. Something has to be done to help make the game more affordable, without sacrificing performance and technology. I want to bring the best materials, best processes and best performance that fit every golfer and improves their game without breaking the bank. There are a lot of people who won't play tour type caliber balls because they don't want to pay fifty plus dollars a dozen. Today Snell Golf can offer tour caliber performance but at an affordable price. By using tour proven technology and a strategic direct-to-consumer business model, we will be able to do just that." The two models now available from Snell Golf, which can be purchased directly from the website snellgolf.com, are the multilayer My Tour Ball ($31.99) and the two-piece Get Sum ($20.99). My Tour Ball features the same materials and construction as competitive Tour models including a cast urethane cover, low compression high velocity core, and multilayer design that can provide both distance, spin, and short game performance for a wide variety of players. The Get Sum model features a 2-piece design that's aimed at players who want a soft feel, lower spin rates, more distance, and straighter shots. A soft Surlyn cover provides enhanced durability while an oversized soft core provides fast speed and plenty of distance. For more information visit www.snellgolf.com . For more news that golfers everywhere are talking about, follow @si_golf on Twitter, like us on Facebook, and subscribe to our YouTube video channel.